"Got myself a crying talking sleeping walking living doll?" From the Uncanny Valley to the Island of the Dolls, we thought dolls were creepy enough until we found this place. Now they are even creepier. 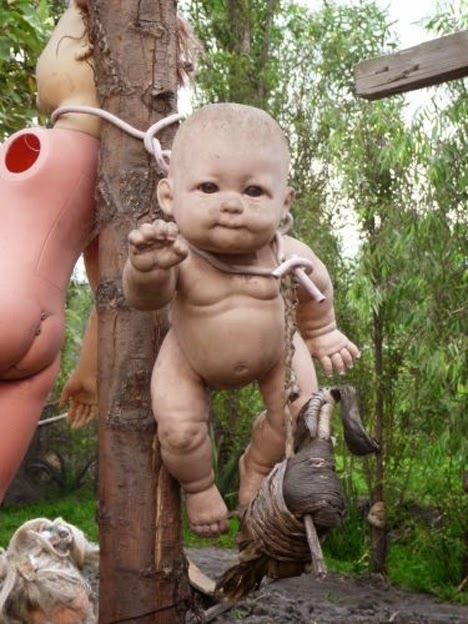 On this Island hang decaying and dismembered dolls. Some even claim they are haunted...Well, it is a tourist attraction for the bizarre seeking tourist so of course the dolls are spooky. Haunted or not, they are definitely creepy. As a tourist would you visit this place? Siv, I cannot remember who now, but SOMEONE posted about Doll Island within the last month. I found it CREEPY CREEPY CREEPY then and I still do. I am not sure I can look at a doll the same again. Hi Siv .. reading Robin's comment above .. I think that's put me off finding out more - but I suspect I'd visit if I was in Mexico .. and that would be a treat! J C Martin, a blog friend of ours, wrote a chilling novel, THE DOLL, about a young girl who steals one of those dolls and brings it back home -- because it asked her to! Brrr. I knew dolls were creepy! Full of malevolent spirits I say. I wonder if people visit the island and bring more dolls. I saw this episode! Creepy, as all get out~ Maybe Chuckie lives on that island, too~ Creepy good! I wouldn't go there ... all those eyes are too creepy!